Jimmy Carter has his Peanuts – George HW Bush hated Broccoli! Forty-five Presidents have occupied the office – and every one has had their most and least favorite foods. 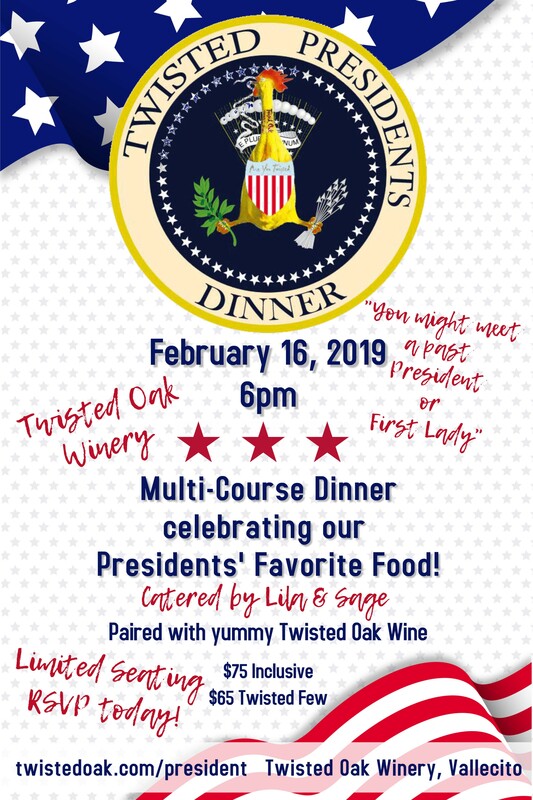 So why not spend an evening with us, featuring a delicious multi-course Presidential dinner whipped up by Lila & Sage, and perfectly matched with yummy Twisted Oak wines! And who knows, you might just meet a past President or First Lady (I’m excited!!). All this for just $75 all inclusive. (Twisted Few member pay just $65 each and may bring any number of guests). Become a Twisted Few Member today! All Wines poured will be available for purchase at some very special prices, that night only. Space is limited, so purchase your tickets today (don’t be disappointed). No politics will be served at this event. A fun fun fun weekend in Murphys!! !